Includes: RDT310 RCD tester in case, Mains plug test lead, calibration cert and instructions. The low-cost entry-level RCDT310 model is suitable for use on supplies between 100V and 280V, and offers 0.5I, I and 5I tests, with provision for tests starting at 0ْ/180ْ of the supply waveform, as well as for DC tests. 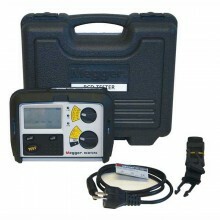 It also has facilities for testing standard and selective RCDs, and covers current ranges from 30mA to 500mA. 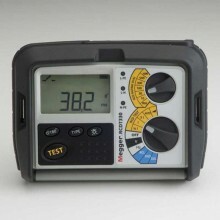 When connected to a live supply, it defaults to voltmeter mode. 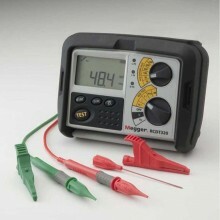 Even if they are inadvertently connected to a live three-phase supply, RCD testers in Megger’s RCDT300 range remain undamaged, and present no safety hazard to the user. Introduced after extensive customer research into the requirements of electrical contractors, these innovative instruments combine rugged construction with straightforward operation, and they are offered at very competitive prices. 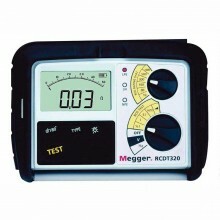 Tests standard, DC and selective RCDs. Minimum voltage 71 V for 300 mA RCDs, 100 V for 500 mA RCDs and 205 V for 1000 mA RCDs. No Trip Test (1/2I): -8 to -2%. Trip Test (I, 5I): +2% to +8%. Trip Time ±1% ± 1 ms.
AC Range 0 to 300 V (25 to 450 Hz). Accuracy ±2% ± 2 digits. Range 25 to 450 Hz. 200 Hz to 450 Hz ± 1 Hz. 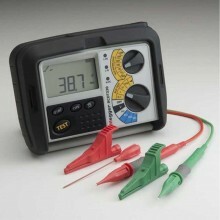 Displayed Range 0 to 50 V.
Error +5%/+15% ± 0.5 V.
10 mA to 50 mA 1 mA steps. 50 mA to 500 mA 5 mA steps. 500 mA to 1000 mA 10 mA steps. Distribution Board Number 99 locations. Operating Range -5 to 40°C. Operating Humidity 93% RH at +40°C max. Storage Range -25 to 70°C. Rating IEC 61010-1 CAT III 300 V phase to earth. Batteries 8 x 1.5 V cells IEC LR6 type (AA alkaline). Rechargeable 8 x 1.2 V NiCd or NiMH cells. Battery Life 2000 consecutive tests. Dimensions 203 x 148 x 78 mm. E.M.C In accordance with IEC61326-1. PDF Specifications of the Megger RCDT310, RCDT320 & RCDT330 Residual Current Testers.